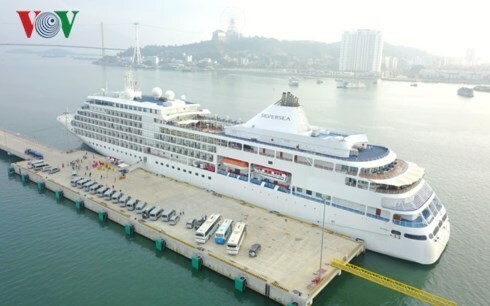 Hanoi (VNA) – The Ha Long international passenger port in the northern province of Quang Ninh welcomed the six-star cruise ship Silver Shadow on February 10-11. Vice Chairman of the provincial People’s Committee Cao Tuong Huy presented gifts and lucky money to international visitors and sent them New Year wishes. Jogn Drapany, a tourist from California, the US, was touched by the warm welcome from local people. He shared that this is the first time he and his family have visited Ha Long and would visit Hanoi later. Most of the holidaymakers onboard hail from the US, France and elsewhere in Europe. Ha Long Bay is a must-see destination in Quang Ninh and was recognised as a UNESCO World Heritage Site in 1994 and 2000. The bay spans 1,553 square kilometres and includes 1,969 islands of various sizes. It features thousands of limestone karsts and islets in various shapes and sizes.